Spend the afternoon rafting in Yosemite--you'll have tons of fun while cooling off and taking in some amazing views. Your trip will include a 3-mile float down the Merced River in a raft that holds 2-4 people. The Yosemite rafting season varies from year to year and depends on factors such as the depth of the rivers, the temperature of the water and the seasonal snowmelt. With a good snowpack year, the season can last anywhere from the middle of July to the end of August. Our rafting staff will assist special needs visitors at the raft entry point, transport their device or chair to the river exit point, and provide transportation for the return trip in an accessible tram. NOTE: Two capable paddlers are required per raft, including at least one adult per boat, and children under 50 lbs. are not permitted in rental rafts. For safety reason, we cannot make any exceptions to these rules. Guests will have 24 hours prior to their raft trip to cancel. If cancelled within 24 hours, guests will be entitled to a full refund. Guests canceling with less than 24 hours notice will not be entitled to a full refund, but handled on an individual basis. Please be alert and cautions during your trip. Have fun and enjoy Yosemite. Rafting is not recommended for non-swimmers. Life jackets must be worn at all times in rental rafts. Children weighing less than 50 pounds are not permitted in rental rafts. Rafting is considered unsafe for small children due to swift and cold water. Two capable paddlers are required in each boat. A capable paddler is at least 5 feet tall and 12 years old. An adult is required in each boat. Glass containers and alcoholic beverages are prohibited on rental rafts. Be cautious and alert! Trees and rocks do exist in the Merced River, creating obstacles requiring your attention. Rafts may not be tied together. Do not take valuables unless properly secured and waterproofed. Purchase price includes raft, paddles, life jackets, and shuttle ride. Shuttles return every 30 – 40 minutes. The last shuttle departs at 6:00 pm. Only paid persons may ride in rental boats. Do not enter roped off areas on riverbanks. Please respect these sensitive areas. Do not tie rafts together at any time. Please beach rafts on sand or rock areas only; don't disturb the natural vegetation around the area. No experience is necessary to rent a raft and experience the delight of rafting down the river at Yosemite National Park. Life jackets are provided and wearing them is mandatory. While reservations are currently unable to be made over the phone or online, reservations for future dates can be made at the Half Dome Village Tour/Guest Recreation Kiosk. Rafting reservations are in high demand and can book up quickly. While no guarantees of availability can be made, we recommend making reservations in person at least one day in advance. NOTE: All raft rentals depart from Half Dome Village. 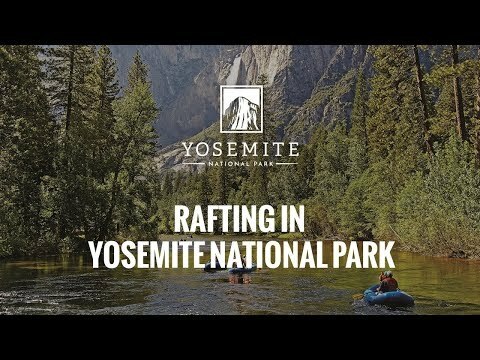 If you'd like to use your own raft, you have the option of purchasing a ticket for the shuttle bus back to Half Dome Village at the end of your rafting journey for $5.00 per person. You can bring your deflated inner tube or raft back with you on the bus, as long as it fits in your lap. We also rent life jackets and paddles for $5.00 each. Life jackets are required for children younger than 13, and rentals are good for one trip down the river.